There are more than 4 million speakers of Swabian; mainly in the region of Swabia. 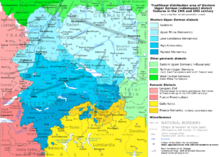 Swabia covers much of Germany's southwestern Bundesland state of Baden-Württemberg (including the capital Stuttgart and the rural area known as the Swabian Alb) and the southwest of the Bundesland Bavaria. Swabian is also spoken by part of the German minorities in Hungary, former Yugoslavia, Romania, and the former Soviet Union. Swabian is difficult to understand for speakers of Standard German. It contains vocabulary that differs altogether from Standard German (e.g. 'jam' in Standard German is Marmelade while in Swabian it becomes Gsälz). —unsigned by 202.36.179.66 on 01:32, 19 September 2008. Swabian can be very different from the other dialects that the Alemanic Wikipedia includes. Persons speaking Swabian as their first language really never can speak German without "mistakes". The offical slogan, crated by the government of Baden-Württemberg and well known all over Germany is: "Wir können alles - außer Hochdeutsch" (We do can all - without standard German). The traditional distribution area of Western Upper German (=Alemannic) dialect features in the 19th and 20th century. This maps shows the region of Alemannic languages including Swabian in the upper right (light blue). Compare this against the map at the main page. The localisation of the MediaWiki most used messages is a requirement. —unsigned by 202.36.179.66 on 01:32, 19 September 2008.